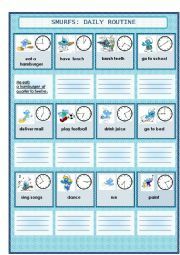 Five different tasks to practice past simple and present simple. 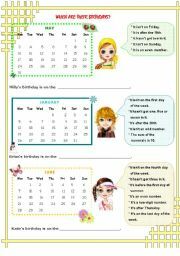 Students practice present simple with daily routines and time. 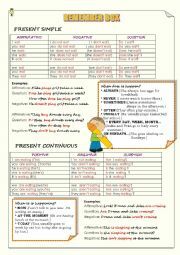 A worksheet about the differences between present simple and present continuous with grammar rules, examples and exercises for students to practice and understand. Hope it´s useful. 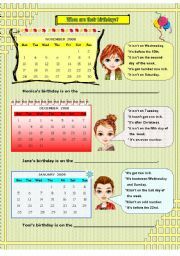 Children read the puzzles and say the date. 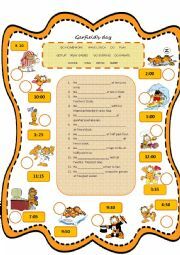 You can use this worksheet to revise ordinal numbers, months of the year and days of the week. complete sentences with the correct form of the adjectives and describe people in pictures. Students identify different clothes and accessories by matching the words and sentences with the pictures. 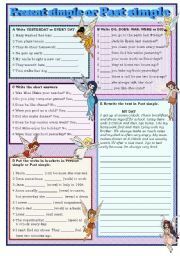 For students to practice affirmative and negative sentences in past simple and to make questions. 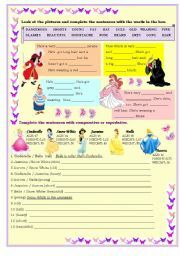 Students complete the sentences using the words in the box and then match those sentences with the correct pictures. 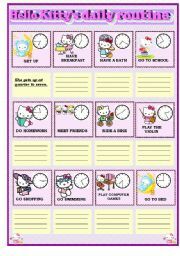 They could use this ws to practice daily routines and time.